“I’m with ya, sister!” Grady replied. 3. Shawn washed and detailed my car on the weekend and there’s something so luxurious about driving a perfectly spotless car (especially when you have kids). 4. We saw the sun today. We might see the sun tomorrow. 5. I asked to be referred to a different ophthalmologist than the doctor who did my eyelid surgery in 2017 and my optometrist listened to me and referred me to a new doctor without any fuss. What’s making you happy this week? A small list of very good things. 1. We’re getting back into the swing of things after an extended holiday break. I forgot how sweet it is to come home after a long day of work when Shawn’s picked Poppy up from daycare. She hears me open the garage and runs to the baby gate at the top of the stairs. I feel like a ding dang rockstar when she screams with joy when I appear at the bottom of the stairs. 2. Tidying Up with Marie Kondo on Netflix. I wasn’t a huge fan of her book when I read it a few years ago. I didn’t really understand her methods and parts of the book seemed smarmy. Watching the show and seeing Marie interact with the people she’s helping is making me actually get excited about de-cluttering the house. I’m utterly charmed by her. 3. I did a whole lot of meal prep on Sunday and it means I managed to pull together homemade, nutritious, satisfying dinners on Monday and Tuesday, our two busiest nights of the week. It feels like a major win. Yesterday I had a terrible day. The kind of day where everything goes so pear-shaped that it's actually kind of comical. Today was shaping up to be similarly frustrating until my parents swooped in to save the day. I want to dedicate this Tiny Happy Tuesday to them. What is Tiny Happy Tuesday? Tiny Happy Tuesday is a prompt to stop, drop, and think of all the good stuff (no matter how minuscule) that adds up to one wonderful life. Poppy came down with a high fever while at daycare. I got the call just a few short hours after I arrived at work. Shawn's out of town and I really couldn't miss work today. My parents dropped everything to take my poor Pops home and take care of her all day. While taking care of my sick baby, they also cleaned my kitchen and made me homemade lasagne for dinner. Throughout the day they texted me pictures of Poppy and Grady playing, reading, and having a great time. I was able to focus on work without worrying about my babies or my parents. They're coming back to help tomorrow! You guys. My parents are amazing. Sometimes life feels chaotic and unmanageable but it's never completely overwhelming because I know I can always call in the big guns. What's making you happy this week? Want to join me? I'd love for you to grab my graphic and join the Facebook group, and share in the fun (don't forget to use the hashtag: #TinyHappyTuesday so I can follow along!). I got to hold a baby on the weekend. A new baby. A freshie. Younger than a week old. He was delicious. Today I was having a high-anxiety, low-patience day and I was given opportunity after opportunity to acknowledge that I'm surrounded by excellent people, and that anxiety doesn't equal weakness. My siblings are all sorts of wonderful and don't make me feel dumb when I ask them to explain stuff to me. Poppy is smitten with Grady's Lego Darth Vader clock and it's hilarious. She carries him around and gives him hugs and cuddles. Shawn's oldest friends from back home were in town this weekend and they came over with their amazing kids. I've met them two times in real life but I love them and I want them to be my friends and they don't make me feel awkward or lame for saying stuff like that. Want to join me? 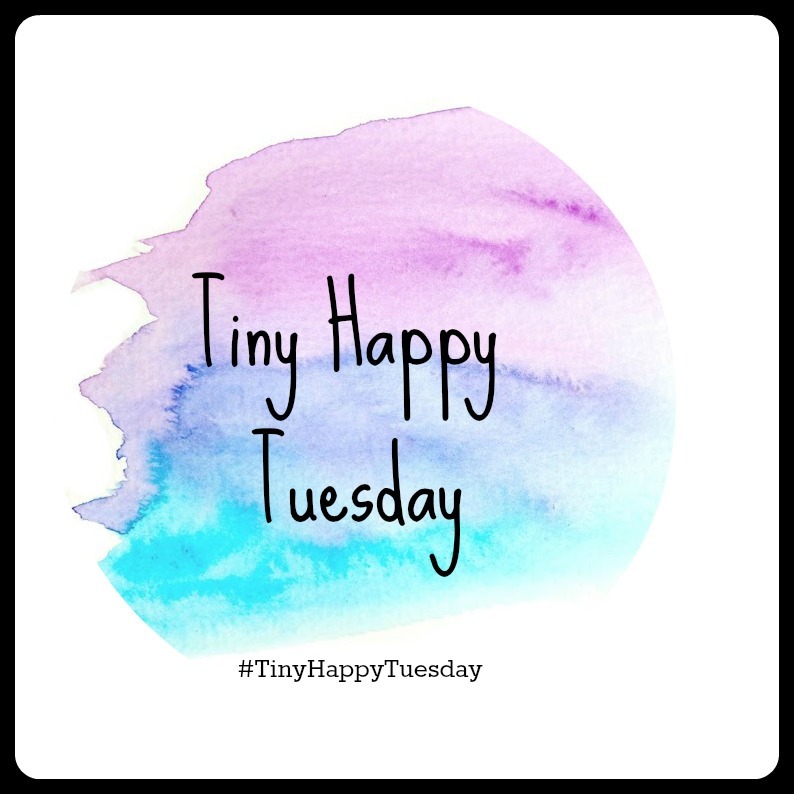 I'd love for you to grab my graphic and join the Facebook group, and share in the fun (don't forget to use the hashtag: #TinyHappyTuesday so I can follow along! ).